The business benefits of consolidation are clear and unmistakable. Stations save on overhead by combining back office operations, including sales and engineering. They often move in together, cutting costs by sharing office and studio space. In Columbus, Ohio, for example, Sinclair’s ABC affiliate, WSYX, is housed in the same building as the Fox affiliate, WTTE, owned by Cunningham but operated by Sinclair. 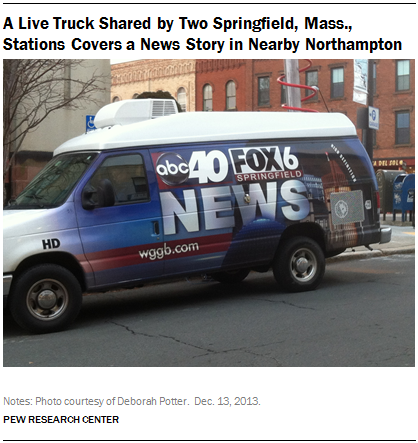 The ABC and Fox affiliates in Springfield, Mass., owned by Gormally Broadcasting, share studios and live-broadcast trucks, branded with both stations’ logos. Another key benefit of consolidation is in the fast-growing revenue stream of retransmission fees. The more stations a company owns or operates, the more leverage it has to demand higher retransmission fees. “Scale matters just to even the level [of the] playing field,” said Nexstar’s Sook. “Without retransmission fees, we’d look more like the newspaper business rather than TV business.”1 More here. The explosive growth of retransmission revenue was on display at the UBS conference late in 2013 as station group executives rolled out the numbers. Meredith Corp., which owns 13 local stations, reported that retransmission dollars had more than tripled in the last three years. Scripps CEO Rich Boehne said the fees had jumped from $11.7 million in 2010 to $42 million in 2013. Media General CEO George Mahoney said his company had enjoyed roughly a six-fold increase in retransmission revenue in four years—from about $12 million in 2008 to nearly $70 million in 2012. The potential for significantly higher ad revenue in election years also boosted stations’ value. 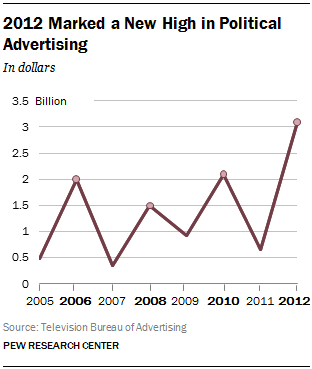 In the 2012 presidential campaign–the first one conducted after the Supreme Court’s landmark 2010 Citizens United ruling –a record $3.1 billion in political ad revenue was spent in local television and many companies have reported huge increases in political ad revenue from the 2008 to the 2012 presidential cycles. At Scripps, for example, that revenue went from $41 million in 2008 to $107 million four years later, although at least some of that increase is due to Scripps’ purchase of more TV stations.